FOR DOGS & PUPPIES 8 weeks or older. Please note that we sell the Australian version of the products listed below. 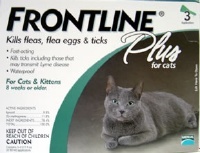 Frontline® Plus has been approved for sale in Australia by the APVMA. The EPA has approved the U.S.A. equivalent of this product for sale. Both of these products (the Australian and U.S.A presentations) contain the same active ingredients, Fipronil & (S)-Methoprene. However, the products sold by us are sold in Australian packaging, which has not been approved for sale in the U.S.A. As a consequence, the Australian packaging does not have EPA approval and the sale and purchase of products in the Australian packaging may be illegal in the U.S.A. 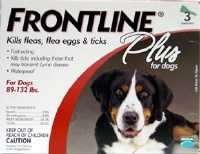 The Product Information Schedule above indicates some of the material differences between the Australian and U.S.A. versions of Frontline® Plus.